Cape Insights upholds the philosophy of ‘Giving Back’. We believe that each step matters, so … we make a voluntary donation to Food and Trees for Africa to offset your impact, calculated on your carbon footprint accumulated by your journey to, from and within South Africa. We believe in responsible ecotourism, leaving only our footprints, conserving natural resources and preserving our cultural heritage. We support awareness-raising campaigns that question the ethical and exploitative impact of human contact with wild species such as lions and elephants, as evidenced in Blood Lions. We wish to promote Africa as an authentic and rewarding tourism destination and support the formal conservation community in their endeavors to secure the survival of Africa’s predators in the wild, such as Born to Live Wild. Golden rules in the natural environment include not picking flowers, removing items, feeding wild animals, littering, or deviating from paths – and in the built environment, not wasting water, being ostentatious with possessions, ‘handing out’ randomly or behaving respectfully among other cultures. We endorse the South Africa Sustainability Seafood Initiative, and abide by their approved seafood guidelines when making selections on clients’ behalf. 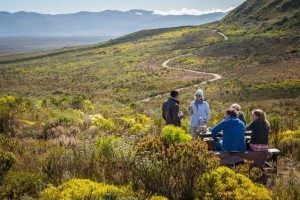 We support The Biodiversity and Wine Initiative which applies biodiversity guidelines to the wine industry, by preferentially choosing its members when selecting wine estates to showcase. We work with Responsible Tourism which is about creating better places to live in and better places to visit. The order of this sentence is key. Its about putting people in the destinations first. Their livelihoods, their landscapes, their learnedness and their living culture. Treating local people with respect and fairness pays back by the bucket load because well cared for locals let us get closer to their culture, their people & their nature. Which is good for them and good for us. We support Fair Trade in Tourism in South Africa and its members wherever possible, which is based on fair share, democracy, respect, reliability, transparency and sustainability. We seek out preferred service providers who share our vision, such as Mogalakwena Artist’s Retreat, as well as initiatives like !Khwa ttu San Cultural and Educational Centre that highlight issues facing minority cultures; Solms Delta Museum for championing oral history & workers’ rights; Grootbos Private Nature Reserve for its dedication to the Cape Floral Kingdom & eco tourism benchmarking; Bushmans Kloof Wilderness Retreat for highlighting San/ Bushmen culture. Our tour leaders are officially accredited by SA standards. We subscribe to an ethical code of conduct and practice Fair Trade principles. We strive to promote what is unique to South Africa, and to act as ”good news ambassadors”.